The Azul Sensatori is a gourmet all-inclusive concept by Karisma Hotels, and features spacious facilities with many activities and services. 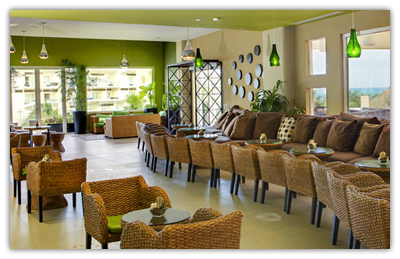 The hotel is designed to accommodate couples, groups, wedding parties, families, and friends. 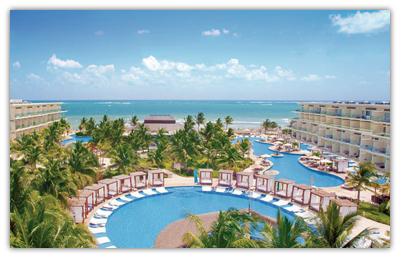 It is located in the beautiful “Bahia Petempich” in Riviera Maya, Mexico. The hotel lies 20 minutes south of Cancun International Airport, 25 minutes south of downtown Cancun, 35 minutes north of Playa del Carmen and 30 minutes north from the Mayakoba Golf Club. Azul Sensatori features an Adults-Only section in proximity to the adults-only pool and restaurant, a Family Section steps away from the kids club, and a Premium Section with added amenities and services. The Azul Sensatori features several suites to choose from, each tastefully designed in contemporary Caribbean style with dark wood accents and canopy beds. The 435 spacious accommodations are located throughout four story buildings with an elevator in each building. Enjoy views of the pool, garden, and ocean. Restaurants, bars, kids club, spa and fitness center are available on site. All accommodations come with air conditioning, 32″ plasma TV, DVD player, IPod docking station, king size bed or two queen or one queen + sofa bed, in-suite Jacuzzi, radio/alarm clock, safety deposit box, once daily stocked minibar, iron and ironing board, coffee maker, oversized balcony or terrace, direct dialing telephone, deluxe bathrobes, private marble bathrooms with rain forest showerhead, hair dryer, double sink and vanity mirror. The Azul Sensatori offers dining in six restaurants with a wide range of dishes to entice any diner. Dining options include international, Italian, Caribbean, and Mexican cuisine. They also offer seven bars where you can relax with friends and a premium drink. Room service is available 24 hours.